Low Carb Angel Biscuits and Sausage and Vegetable Quiche Recipe, just two name a couple. I’m super excited to share this months products from LC Foods Company with all of you. It was an awesome mixture of sauces, marinades, biscuits and pie crust. Yes, PIE CRUST!! I used it to make a quiche, but we will get back to that in just a second. This post has a little something for everyone. My gluten free friends. My keto friends and all my Peace Love and Low Carb Friends. Even better, there is an awesome GIVEAWAY at the end of this post. The thing that I like most about LC Foods Company, is that they do a great job putting those foods back on the table that we thought we would never be able to eat again. Low Carb and Gluten Free Pancake Mix, Low Carb Gluten Free Bread Mix, Low Carb and Gluten Free Brownie Mix, just to name a few! And they do it with quality ingredients in mind. Their products are void of any simple sugars, corn syrups, wheat, and high carbohydrate flour products, low in net carbohydrates, and high in fiber and protein. They are also dedicated to weight management and their products are designed to be diabetic friendly and not easily spike blood sugar levels, which releases insulin to create fat storage in the body. These biscuits… Where do I even begin? Low carb bread products are always so hit and miss. They are often eggy or grainy in texture and they just never seem to replicate the real thing. WELL, these biscuits do. These Low Carb Angel Biscuits are so appropriately named. I’m pretty sure they were created by angels. They have an amazing texture. 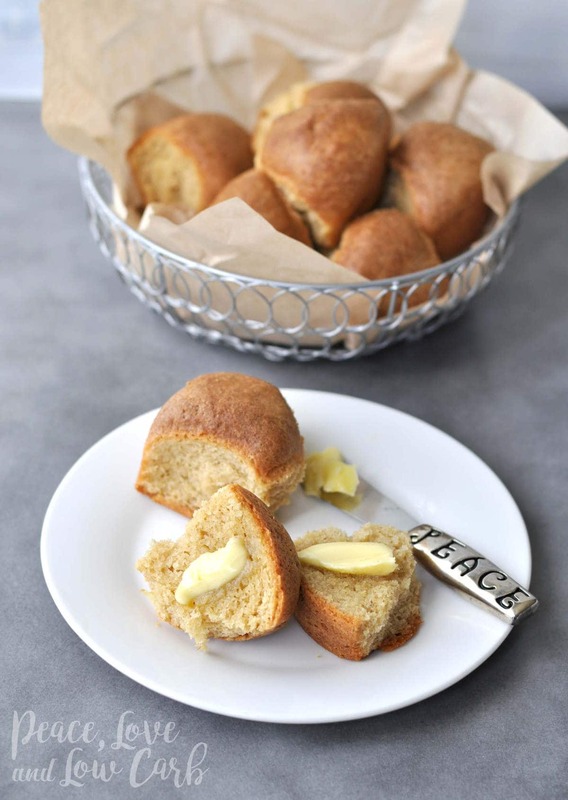 They are a lot like pull apart rolls and have a subtle sweetness that reminds me of cornbread. We ate them with a big chunk of salted grass-fed butter slathered on. They are also amazing with low carb sugar free raspberry preserves or to use to make a low carb biscuit breakfast sandwich. They are only 1 net carb per biscuit. You can get them as a mix or you can buy them already fresh baked. How convenient is that? Although these particular biscuits are not gluten free, they do have several gluten free options available. Like this Low Carb, Gluten Free White Bread Mix, or this Low Carb Gluten Free Breading Crusting Mix. You can order some for yourself or read more bout them here. I specifically asked for them to send some of their condiments this month. Many of the store bought dips, dressings, sauces and condiments are packed full of sugar and unnecessary filler ingredients. 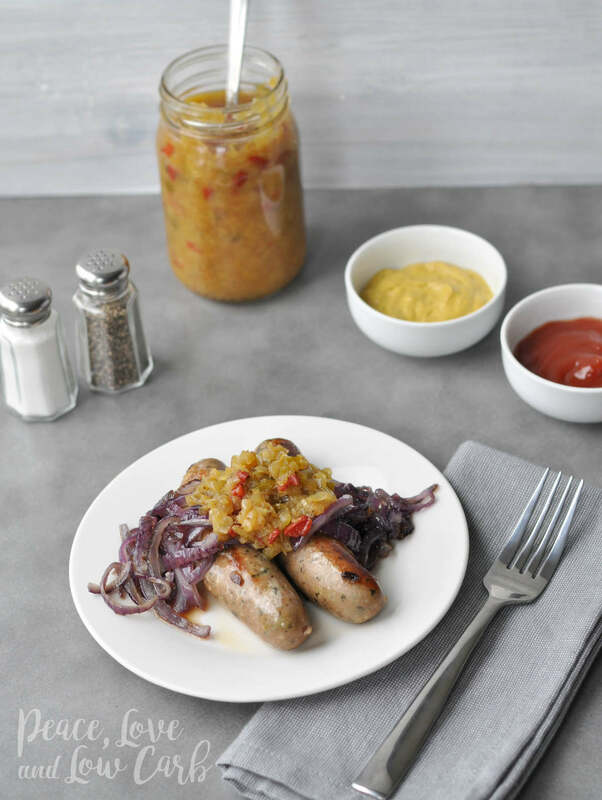 As much as we would all love to be able to whip up our own sauces at a moments notice, many of us do not have the time and need a healthy pre-made option. It’s nice to know they are out there when we need them. 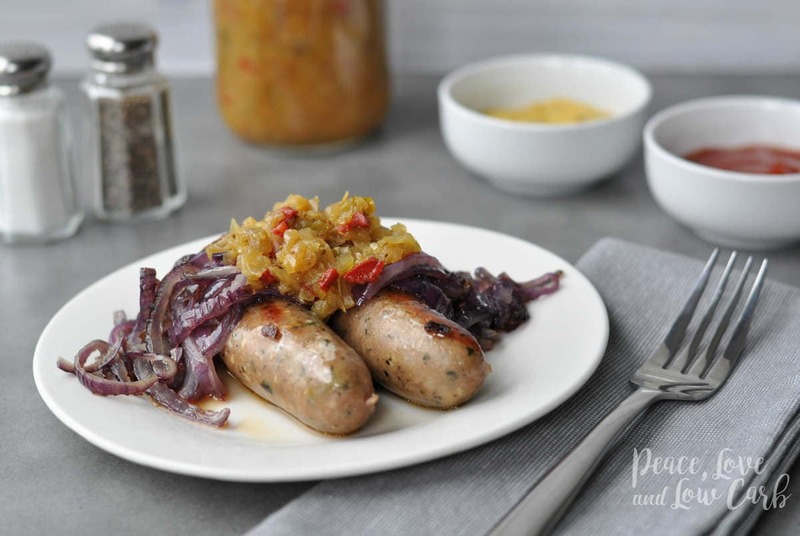 This Hot and Spicy Chow Chow Relish was awesome paired with some sweet caramelized onions. We ate them on top of chicken, feta sausages. Seriously SO GOOD! Excited to use it for all those summer cookouts I have in mind! I was really impressed with all of the sauces. 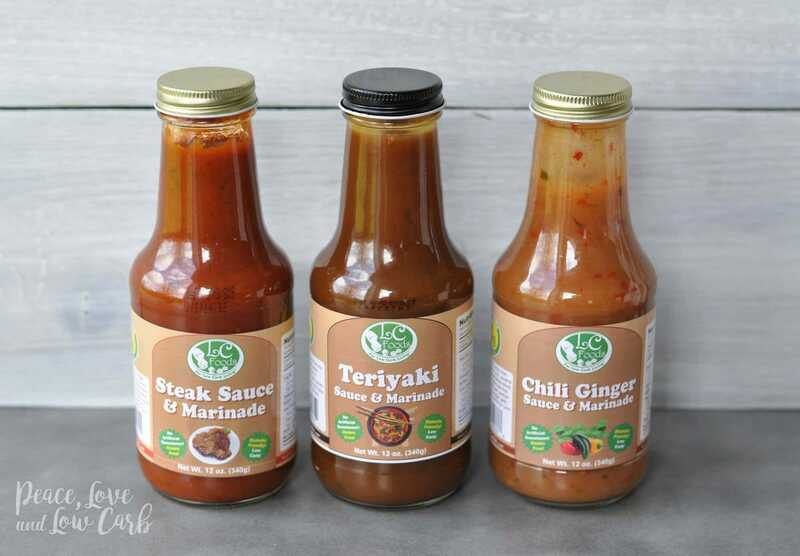 The Low Carb Steak Sauce and Marinade, the Low Carb Teriyaki Sauce and Marinade and the Low Carb Chili Ginger Sauce and Marinade. They all have minimal ingredients, are low carb and gluten free and don’t contain any strange, hard to pronounce funky ingredients. They are also really versatile. You can use them as a sauce, or as a marinade and even as salad dressing. Dinner really couldn’t get any easier than throwing some chicken breasts and a jar of the low carb teriyaki sauce in a crock pot and just letting them do their thing. Easy and delicious! Ingredients: Water, cider vinegar, tomato paste, gluten free soy sauce, onion, red wine, natural stevia extract, erythritol, olive oil, sea salt. Contains less than 2%: spices, citric acid, liquid smoke, bourbon, vanilla extract, cultured dextrose and xanthan gum. Ingredients: Water, gluten free soy sauce, red onion, natural stevia extract, erythritol, sesame oil. Contains less than 2%: marin spices, green onion, xanthan gum, lime juice, citric acid and cultured dextrose. Ingredients: Water, apple cider vinegar, red jalapeno chili, sesame oil, tomato paste, natural stevia extract, erythritol, sea salt, contains less than 2%: spices, onion, citric acid, xanthan gum, chilies, red wine vinegar, garlic, orange juice, cilantro and lemon juice. I decided to use the Low Carb Chili Ginger Sauce on shrimp. I sautéed the shrimp in the sauce and nothing else and it was amazing. Within just a few minutes, dinner was ready. It has just 1 net carb per serving and in addition to being low carb, it is also gluten free. I can’t wait to use it again to make a big, hearty beef and vegetable stir fry. I also think it would make an amazing salad dressing. Think Asian chicken salad… YUM! Grab some here. As a general rule, I have never been a steak sauce kind of girl. I think a perfectly cooked steak doesn’t need anything else with it. Except for maybe some grass-fed butter on top. So when I made this beautiful grass-fed filet mignon, I put the sauce on the side. You know, just in case I didn’t like it. Well I’m pleased to announce, that I would have been wrong. It is delicious. I kept going back for more dips. Next time I use it, I want to make kebabs on the grill. Marinate some nice big chunks of beef in this sauce overnight, and then skewer it with vegetables and grill it up. Just like the Low Carb Garlic Chili Sauce, it only has 1 net carb per serving, is gluten free and contains no added sugars or preservatives. 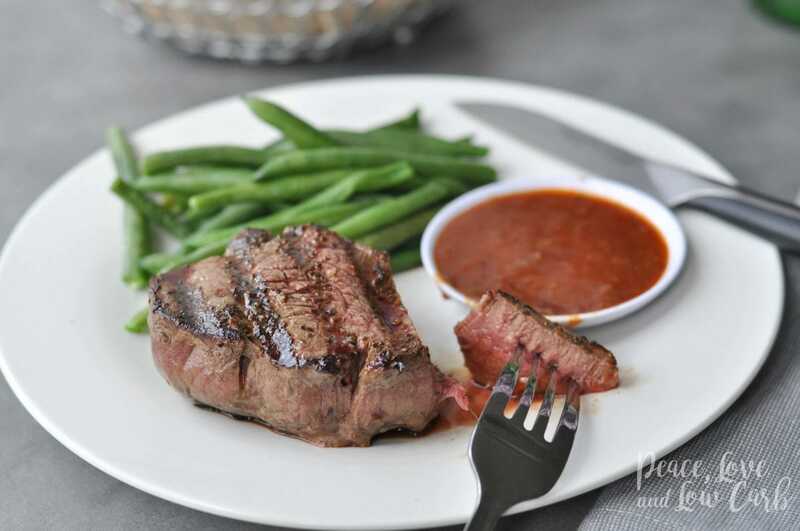 A delicious, healthy alternative to the high carb, sugary steak sauces out there. Grab some here. In addition to the Low Carb Angel Biscuits and all the delicious sauces and marinades, I also got to try their new pie crust. 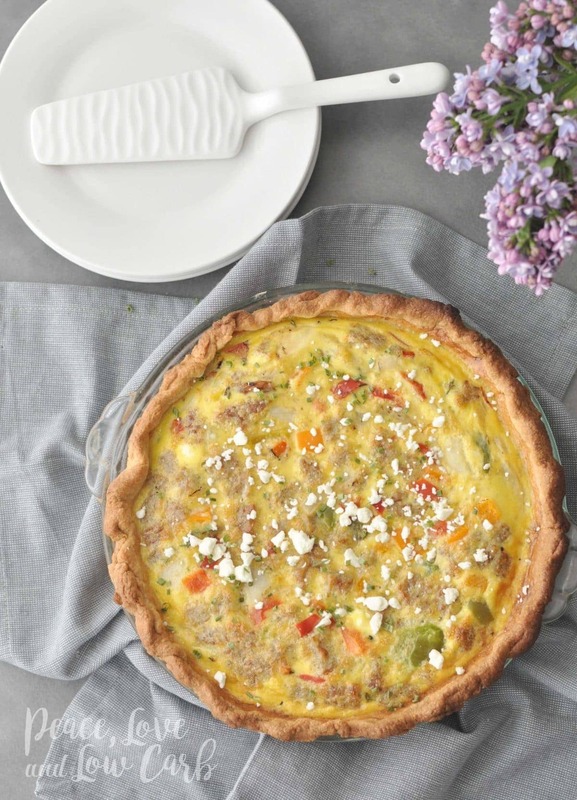 Many people would see a Low Carb Pie Crust and automatically think of a fruit filled pie, my mind always goes towards the savory, so I instantly thought quiche! Would you believe me if I told you that I have never made a pie crust before this? In fact, I don’t even own a rolling pin. I used a really large cylindrical vase to roll out the dough. It was pretty amusing. It was quick and easy to make. This Low Carb Pie Crust seriously did not disappoint. It was the perfect blend of crispy and flaky. The bottom of the crust even stayed crisp after adding the filling and baking it again. I had a serving of the quiche and then immediately had another one because I could not get enough of the crust. It really made me want to use it to make a chicken pot pie. It would be perfect for that. I want to take the Low Carb Chicken Pot Pie recipe from my site and then use this as the crust. The mix is enough for two full crusts, so making a pit pie is a no brainer, because you have enough crust for the top too. Grab some here. 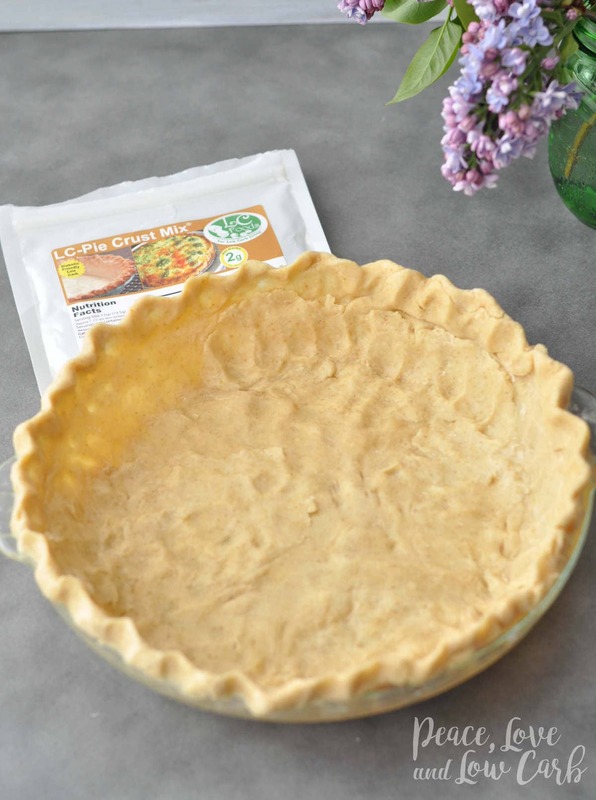 Prepare Low Carb Pie Crust as per the directions on the package. In a large mixing bowl, crack the eggs and fork whisk. Mix in the sausage, feta, heavy cream, bell peppers, onion, garlic, sea salt and black pepper. Pour the mixture over the top of the prepared crust. Bake for 45 minutes or until the eggs are completely set. 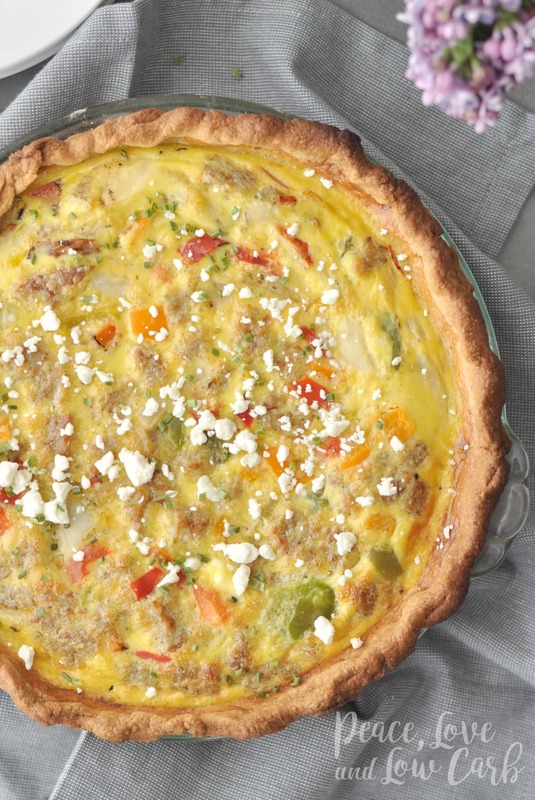 Sprinkle the remaining feta cheese over the top before serving. I wish the pie crust didn’t have sucralose. I’m ok with the rest of the sweeteners, but have read many bad things about sucralose. I have not seen anything that resembles sucralose in this package. I do see Stevia. Am I missing something? Brownie mix, Brownies (ready to eat) and chocolate mousse. Angel biscuits, pie crust, teriyaki sauce. Yummy! I love to bake! I would love to try the pie crust, biscuits or sauces! chocolate bar, brownie mix or chocolate chips for baking! Too many to choose from, not a bad decision to have. The pie crusts, biscuits, and steak sauce all look amazing! I’d love the brownie mix, pie crust mix, and breading mix. 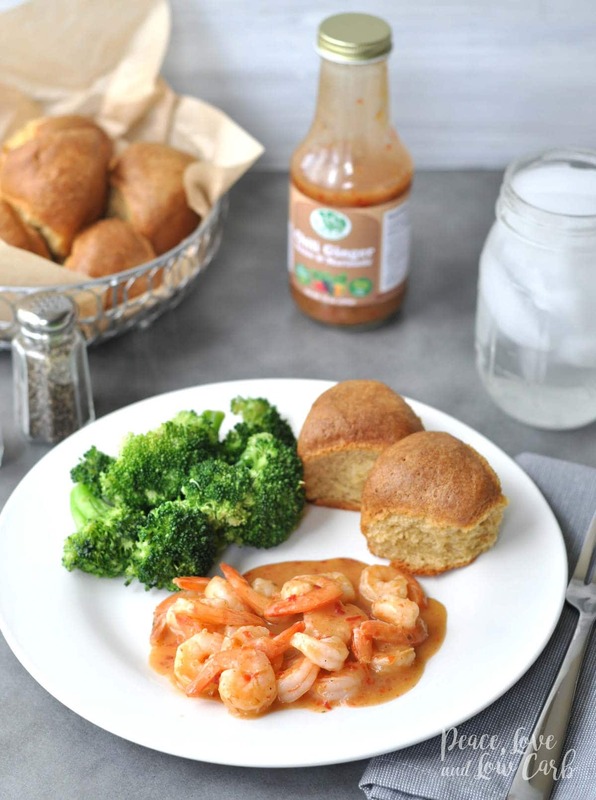 Brownies, bread, sweet chili sauce – all looks great! I would probably go with the 3 marinades, but the biscuits tempt me. The angel biscuits, the chili ginger marinade and the pie crust sound wonderful! I’d really like to try the brownies for dessert as well. I have had the angel biscuits and absolutely love them so of course I would love them. I am dying to try the pie crust and now you have me very interested in trying the steak sauce & marinade. Wow, Angel Biscuits and pie crust!! That pie crust!???????? I love your blogs, and photographs. However, it makes me want to buy just about every single thing!???? I’m excited to try this recipe! I appreciate all your suggestions, and helpful tips. Thank you! I want to try everything!! LOL But if I had to choose 3, probably the ginger chili sauce, low carb ketchup and the low carb teriyaki sauce. fast to put with a protein. OMG I NEED this in my life! I am a bread fanatic but just found out I have a gluten allergy. Ugh! thank you for sharing! Angel biscuits, teriyaki sauce and chili ginger sauce. I have a mighty need for the Low Carb Biscuits, Low Carb Waffle Mix, and Low Carb Brownie mix! I’d love to try the tempura batter, country biscuit mix and the pasta flour. Thanks for the chance to win! Angel biscuits and pie crusts!! As a Southern Belle I can’t turn down the angel biscuits! I’d love to give the tempura batter and steak sauce a try as well! Angel biscuits, brownie mix, and raspberry preserves! Pie crust, chili ginger sauce (I need that now!) and steak sauce since it’s grilling season. Love steak sauce on my burgers (not steak please). I would love to try the low-carb breading mix, the low carb steak sauce and the angel biscuit. So glad I found your blog, site and facebook page. You have amazing recipes and have helped so many people succeed. Thanks for all you do Kyndra! I have ordered several things from LC Foods. I would love to try the biscuits, chocolate chip cookies, and steak sauce. Thank you for the links to LC Foods. I would love to try the biscuits, sauces and preserves. I’d love to win the pie crust, the biscuits, and the chili ginger sauce! All, but especially the biscuits! Brownies!! Pie crust!! Anything really! I love food. Excited to try the biscuits! I NEEEED low-carb in my life. I eat to much bread. LOVVVED all the recipes that you posted. NEVER had a quiche though, I would like to try. Too many things to pick just 3…LOL! I would want to try the LC Ice Cream, Vanilla, Chocalate and BROWNIES!! I would love the biscuits, the steak marinade and the pie crust mix! The sauces look amazing and also the angel cake! I would love to try LC Products as most prepackaged low carb brands have not taste. 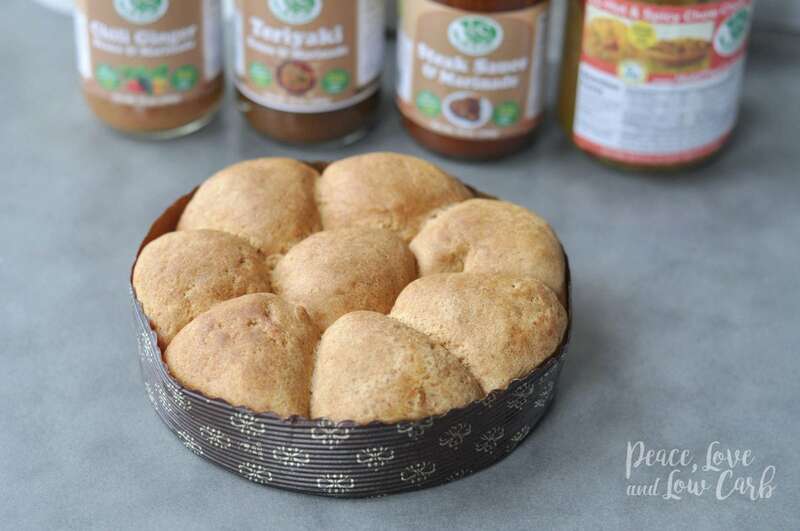 Low Carb and Gluten Free Pancake Mix, Low Carb Pie Crust Mix and Low Carb Angel Biscuit Mix would be awesome to try.m Thanks for the opportunity! I love all of your recipes. It makes my life a lot easier. Thank you! So, since you are MAKING us choise only 3 things..I have to go with the 3 carbiest (it’s a wird…in my dictionary, anyway) things: pancake, biscuit and saucy thickener stuffs! Three of the fav things in my foid world that I have yet to master in my low carb world as “edible”. ???? The steak sauce, teriyaki sauce, and chili ginger sauce all sound so delicious! One of each please! But if I have to narrow it down to 3, I would choose the Angel Biscuit Mix, Chili Ginger Sauce and Pie Crust Mix. Love your recipes so much! Thank you. Definitely thinking about pizza crust mix..! Omg those angel rolls look sooooo delicious! And teriyaki sauce?! To die for! Mmmmm…. I’d love to try the pie crust too! Yummy!!!! Mmmmm!!! I’d love to try the fresh baked bread, sweet mixes, pizza crust! Angel biscuits, bagels and brownies. All of their products look delicious. Thank you for your recommendations and reviews. I would love to try the pizza crust, pie crust and biscuit mix. Would love to try the biscuits, pie crust and teriyaki sauce. I would love to try the biscuits, our crust and steak sauce! Yum!! Would love to try the angel biscuits, teriyaki sauce and anything chocolate. Love the LC products. Well the vinegar isn’t great for me, but the dextrose counted me out. Frustrating when there’s always something you can’t have. Any item that does not have artificial sweeteners. Allergic to them. It is really hard to narrow down, but I think I would go with the angel biscuits, pie crust, and the steak sauce! I would love some fresh baked white bread, hamburger rolls and hot dog rolls. That is if you mean pick 3 from their site. It you mean 3 of the products you just mentioned, I would pick Angel Biscuits, Pie Crust Mix and Teriyaki Sauce. Love your recipes and enjoy reading your posts. Thanks for doing this. I love LC Foods and am forever grateful that you introduced us to the company. I definitely need their pie crust, biscuits and chili ginger sauce and marinade in my life!! ..quiche, most definitely, but also I am dreaming of a key lime pie with a flaky tender crust in my future! I would love to try the pie crust, the Angel biscuits and all of their chocolate products! (one at a time, of course!). Perhaps start with the brownie mix! Kyndra, you are an angel. Keep spreading the peace, love and low carb ideas. Everything looks amazing. My 3 choices are Low Carb Multi Grain Bread fresh baked, Low Carb Banana Bread fresh baked, and Low Carb Cinnamon Bread fresh baked. Divine! Well I messed up on my last post comment. LOL I didn’t realize I had to pick 3 from this post. In that case, I choose the Hot and Spicy Chow Chow Relish, Low Carb Pie Crust, and the Low Carb Angel Biscuits. Oh yum! Thanks for the chance to win! I would love the try the brownies, sauces, and biscuits. 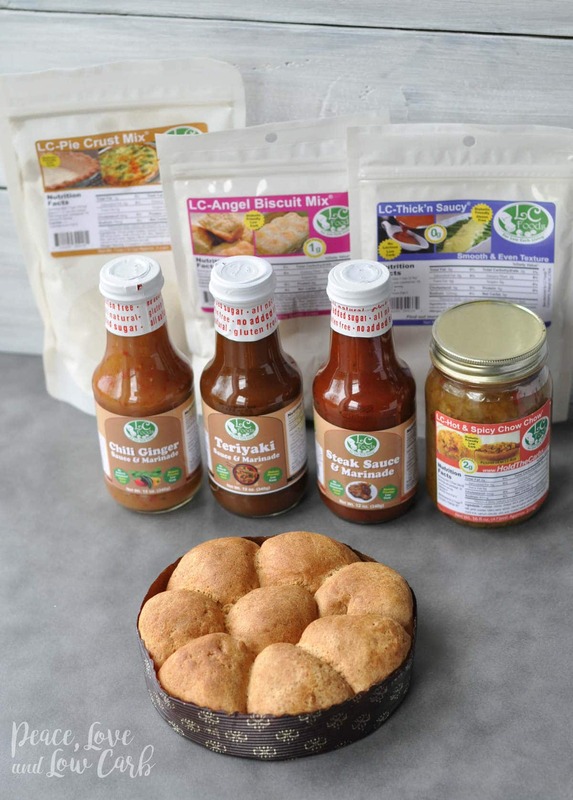 Low Carb Pie Crust, Low Carb Angel Biscuits and the Low Carb Chili Ginger Sauce. Thank you so much for the oppertunity to win these products. Granola cereal mix chocolate chip and almond, dark chocolate hazelnut spread and cinnamon bun mix. Thanks, Kyndra for the opportunity to win this amazing giveaway! Biscuit mix, brownie mix, and pie crust mix!! 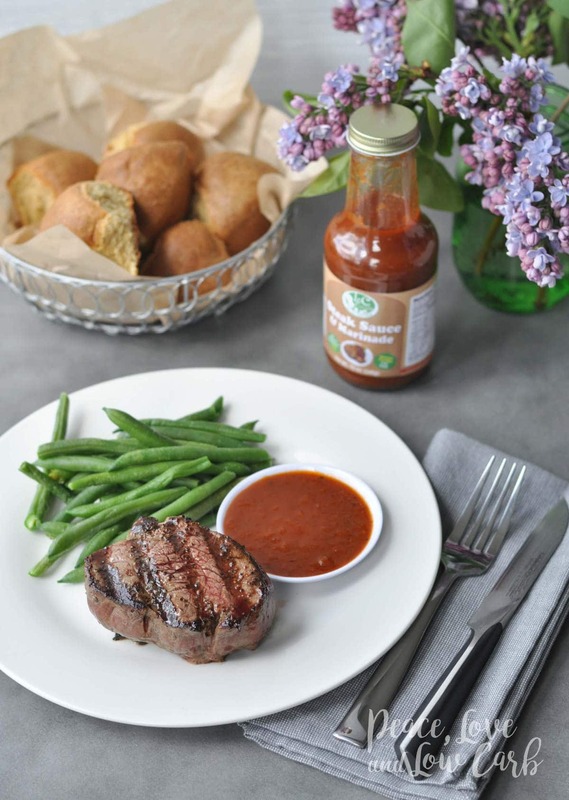 I would like to try the steak sauce and marinade, I like that it only has 2 carbs per serving. I would really like to try that pie crust too! Also ketchup and teriyaki sauce.